One of my favorite things to do is figure out how to repurpose stuff around my home. 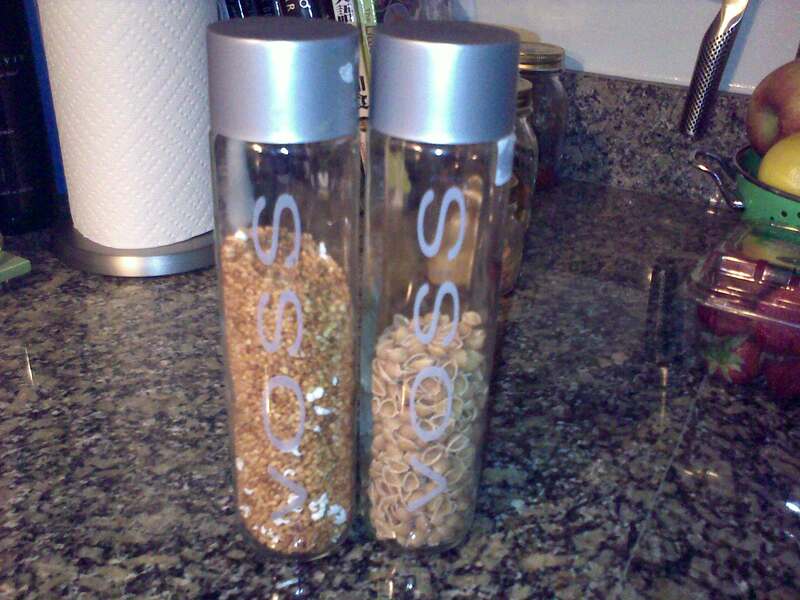 We used to buy lots of bottle water, so I’ve accumulated a ton of these Voss glass bottles. The mouth of the bottle is pretty wide, so I’m able to reuse them to hold pastas, grains, and other kitchen goodies. This is definitely a way to save $$$ and also help our environment at the same time. Next time you have a food jar or glass bottle, maybe you can rinse and reuse! If you’re not in the kitchen often, you can also reuse glass jars/bottles to store school supplies, tacks, nails, etc. The possibilities are endless! Earth Day is around the corner, so be sure to incorporate something into your life, that will help our environment! This entry was posted on April 20, 2010 by happy217. It was filed under Home and Living and was tagged with earth day, eco chic, eco chic idea, eco friendly, ideas for storage, recycling, recycling glass, repurpose, reuse, reuse glass, reuse glass jars, ways to reuse.